A day's work started at dawn as people slowly woke up in the shelter of their houses. Before the night's chill had worn off, fires were stirred up and sweet potatoes or taro roots were roasted. 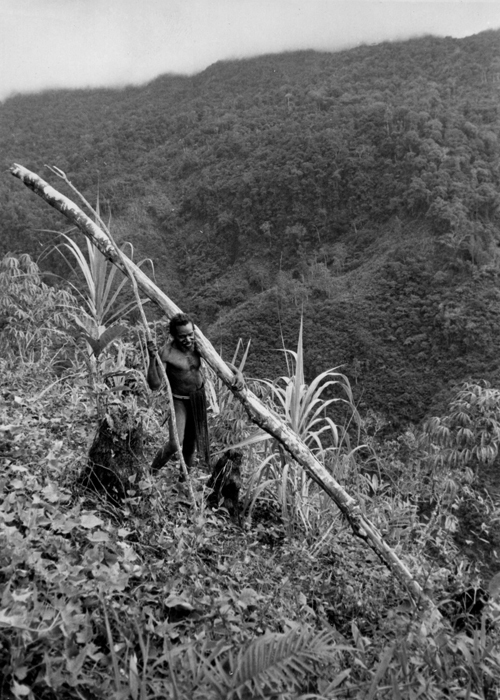 Occasionally people reheated greens that had been steamed the night before and stored in short bamboo tubes to be enjoyed for an early breakfast or taken out to gardens and forest for snacks later in the day. Children often slept in the houses of their friends - their age mates or an older man or woman with whom they were temporarily living. They might be offered food, or they might run home to their mother's house to get the portion of food she had prepared for them. Once the cooking was done, the old banana leaves that had been used as containers were thrown outside and then swept out of the yard with all the other trash. 043-57: Ke, Bossboy Gul's first wife, uses her yinge to sweep her yard. 043-67: Gandim spends the first part of the morning in a sunny grove outside of Gunts Yard working on a bilum. Gul's three wives had, between them, eight children ranging in age from about two to eighteen years old. Gandim, his third wife, had two daughters and a son. Her younger daughter, Koram, was still a toddler, just at the age when she was becoming too old to be carried to distant gardens. She stayed with her mother as long as possible in the morning, hoping to put off the moment when she would be left with other members of the family. The path up to the gardens above Tenegump lead up a steep path that passed close to the huge old growth trees marking the sacred groves of each lineage. 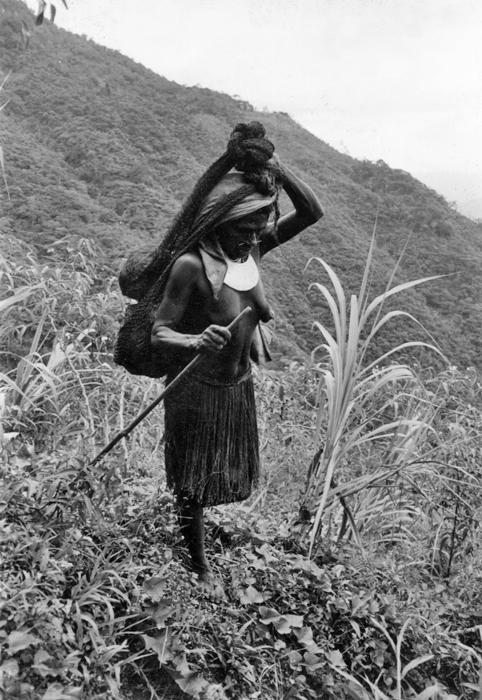 Ke's youngest son, Mat'a, had to scurry to keep up with his mother who was walking quickly, carrying nothing more than an empty bilum, a small ax and her yinge. 044-16: The path from Gunts up to Ganegai. Above the area of old growth forest, the slope opened out into a broad area covered with garden plots at all stages of cultivation. Ke paused in the shade of the overgrowth beside an old garden, abandoned since all the crops had been harvested. The saplings that will grow up to re-forest the area were already well on their way. As I caught my breath from the hike up ed her yinge. I was not quick enough in focussing the camera, so the picture was snapped at the very moment she finished and, in one flowing gesture, let the ax drop to the ground. 044-21: Ke sharpens her yinge. 044-23: Mat'a has caught up with his mother and they cross into the garden area. The high-altitude garden area above Gunts was divided into individual plots for a number of different women. 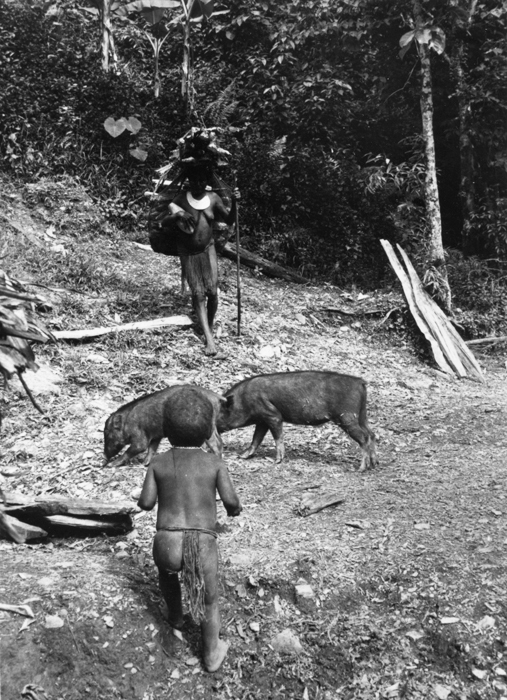 When the area had been cleared for gardening, the men constructed a stout fence to protect all the plots from both the freely ranging domestic pigs and any wild pigs that might wander nearby. A wild mango tree had been used as a major corner support for the fence and as one of the stiles allowing easy access to the gardeners. Ke and Gandim went right to work among the sweet potatoes vines covering the ground below the sugarcane and manioc plants. 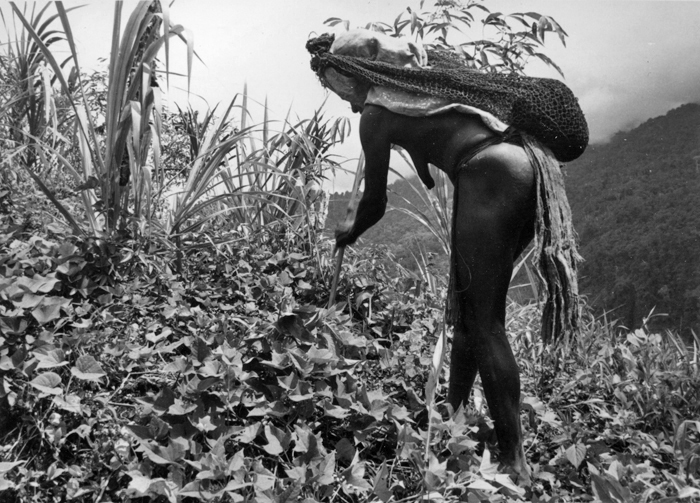 At this stage, the sweet potatoes were ready to harvest, but the sugarcane was still young. Here and there the manioc plants provided a bit of shade. All the plots had a fine view of Gembiama, to the west across the Righan River ravine. 044-25: Ke probes for sweet potatoes in the rich soil beneath the thick sweet potato vines. 044-28: Gandim searches for sweet potatoes. Mat'a sat down in the light shade of a manioc plant. He had spent the whole morning on the fringes of the women's group, occasionally hunting for cicadas in the surrounding brush. Now he is tired and has started screaming. Both his mother - ama, Ke, and his "little mother" - ama agi, Gandim, shout at him impatiently. I notice that he is rubbing the moisture from a banana sucker on a sore on his leg. Even if it was the pain of the sore that had been bothering him, neither of the women had any patience for this kind of complaining. Riawe, Ke's eldest child, had come up to the garden along another path and had already harvested the sweet potatoes in another plot. 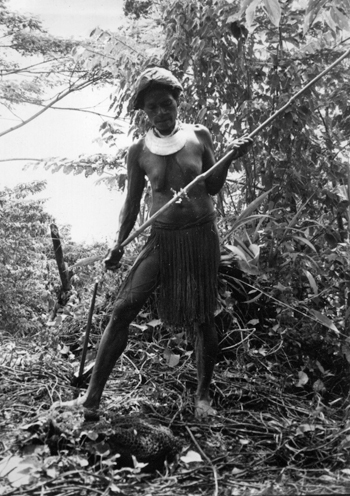 With a single spiraling gesture, she deftly raised the bilum from the ground and places the strap over her head. 045-06: Riawe arrives with a bilum half-filled with sweet potatoes. 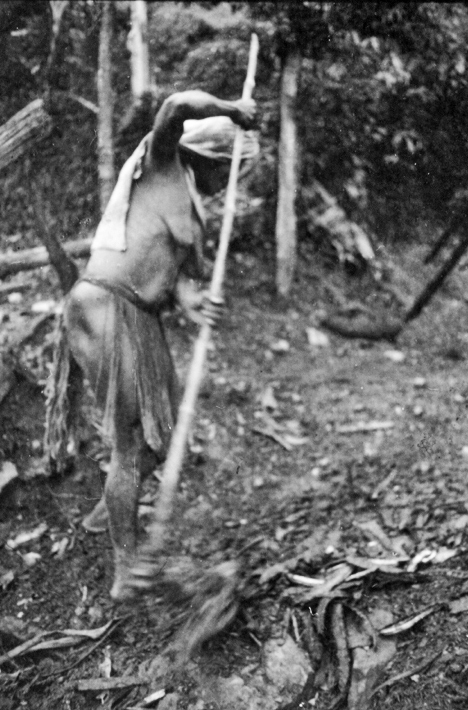 045-00: Kabi passes through the garden carrying a tree trunk destined for firewood. Working in the gardens was not an isolating activity. Men and women, here and there in their individual plots or just beyond the fence in the forest, could carry on lively conversations while they dug for tubers, weeded the crops, or picked greens for the afternoon meal. As Kabi walked along the narrow path just below Ke's garden plot, they exchanged the latest news. The view across to Korama territory also provided information. Korama gardens were clearly visible to the eye. 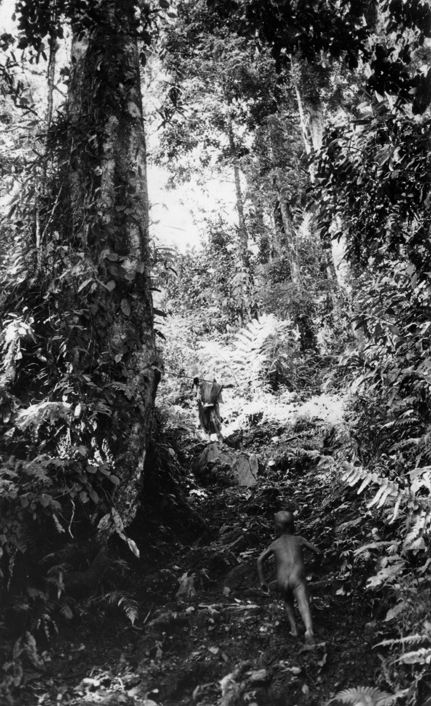 Though the distance was further, it was also possible to "sing out" loudly enough to be heard across the ravine. The weather was always variable. Morning mist would usually give way to some sunny hours, but these could be interrupted earlier or later by sudden downpours. Seeing clouds move in from the east, Ke set out toward the small thatched garden hut where we waited out a brief storm. They were particularly concerned that my clothing and my camera would get wet. Their own clothing, bilums and crops easily withstood even moderate rain, and would dry out quickly as soon as the sun returned. I had brought a small tin of cheese along, and we all heartily enjoyed this little snack while we sheltered from the rain. 045-04_05: Ke slings the small bilum with her ax on top of her now heavily loaded gardening bilum. 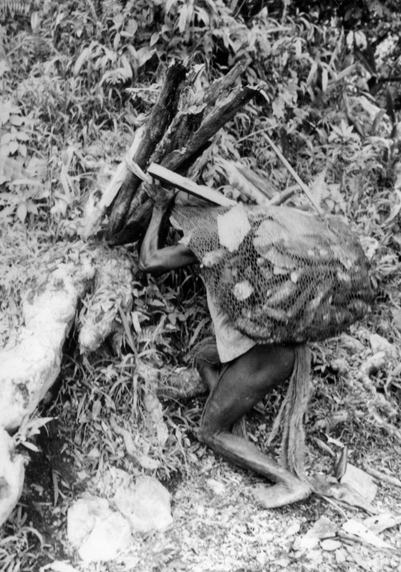 045-10: Riawe uses pandanus leaves to tie firewood into a bundle. 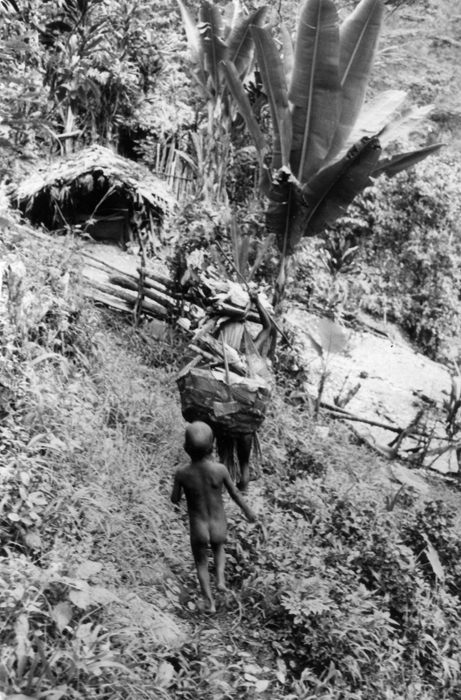 The harvest for one or two day's meals was not the full extent of what the women would be carrying home. 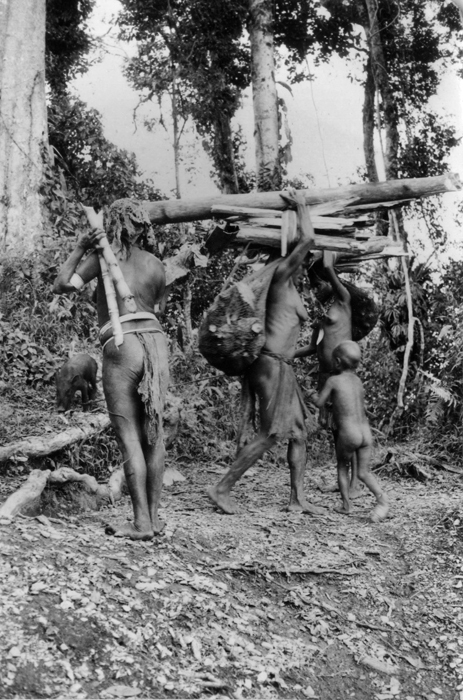 Firewood that had been split by the men of the family also had to be carried down to the hamlet. The women prepared the bundles using whatever materials were conveniently at hand - in this case, pandanus leaves similar to the miom leaves that had been used in building our house. 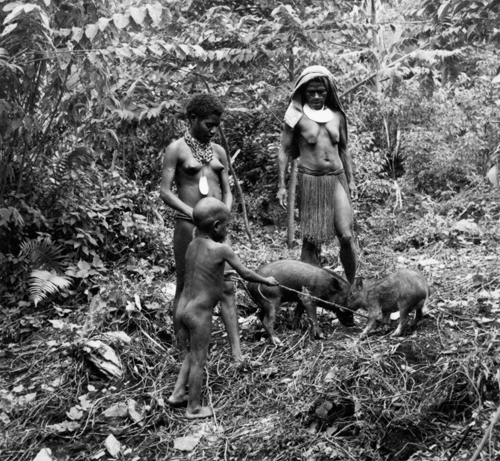 Not only was there the harvest and firewood to carry, but two small piglets had to be led home. 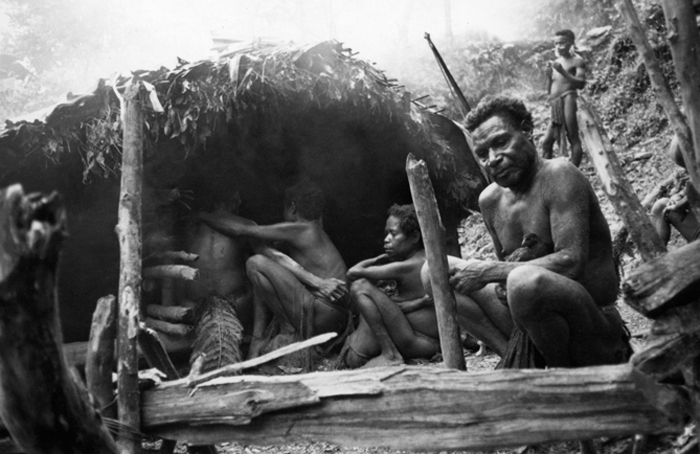 Mat'a was holding on tightly to the thick handmade rope tied to each of their forelegs. His energy was fully recovered and he insisted that he be allowed to take care of the pigs. In the excitement of his high-pitched importuning, I entirely forgot to document just where these piglets had been while the women were inside the garden fence. I wonder now, looking back all these years, whether they had simply been tethered outside by the main path. Would there have been no danger that they would be stolen, or molested by dogs? 045-16: Mat'a wants to lead the piglets home. 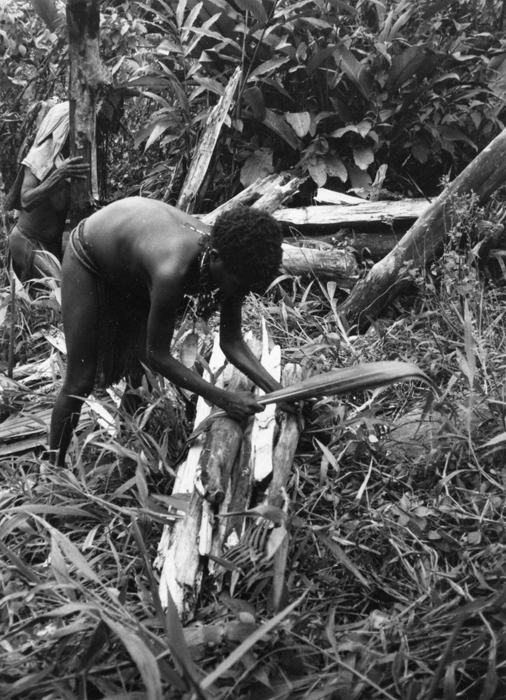 045-23: Ke loading firewood above her bilum full of sweet potatoes. 045-20: Setting off for home. Mat'a was just in front of me, bringing up the rear of the single file as we approached the house. 045-24: Ke and Gandim's house perched on a narrow terrace at the upper edge of Tenegump hamlet. Koram was eagerly awaiting her mother, Gandim, who had to walk all the way to the other end of the yard to the entrance of their part of the house. 045-34: Koram in her front yard. 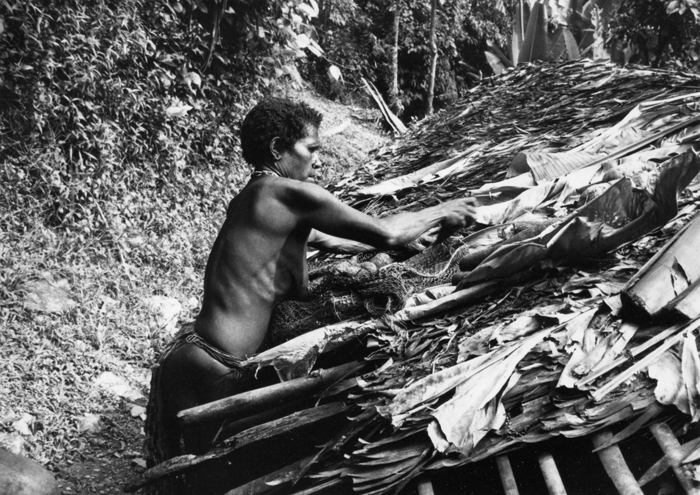 The first thing Ke did was to sort the various parts of her harvest, using her roof as a table. 045-31: Ke unpacks her bilum. Before preparing the evening meal, Ke and Gandim (now carrying Koram) went down to the house of Gul's second wife, Dang. Dang was hosting visitors from Kwima on the other side of the mountains. The visit was occasioned by news of the death of a woman and people were comforting each other. In between ritual mourning, they invited me in, but I felt it was no longer appropriate for me to be tagging along. 045-36: Ke sits at the threshold of Dang's house, her arm around a mourning visitor. 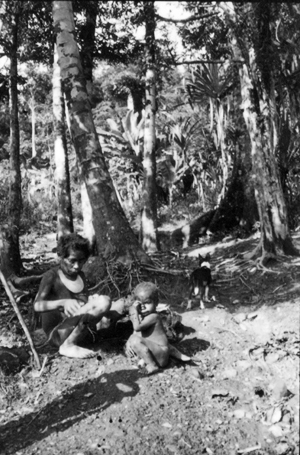 Gandim, with Koram hugging her tightly around the waist, remain outside in the yard with a man from Kwima who holds a chicken in his lap. Smoke from the evening fire is filtering up through the roof thatch. It was time for me to go home to Gunts to find out what Marek had been up to during the day while we cooked our own supper together.